I know, make some clean fakeaway tortilla chips! These little bites are so so easy to make, and give you all the feeling of a comfort snack with none of the negativity or crazy amounts of sugar and salt – I love them! I make a bowl for when we are watching a movie, or if we have friends over, or when we have my favourite spicy black beans – they are perfect. And so simple you absolutely cannot go wrong. Pre heat oven to 150 c.
Brush the oil all over one side of your wrap, and sprinkle the salt and pepper evenly over the oil. 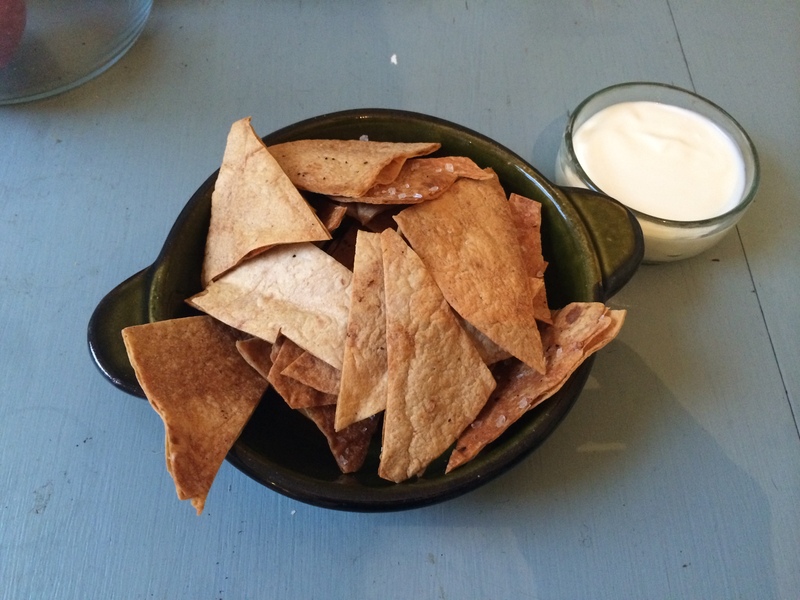 Cut the wraps into tortilla chip triangles and lay out on a baking tray. Put in the oven for 20 minutes, or until the chips have hardened. Voila! It really is that straightforward. I serve mine with a pot of natural yoghurt, which goes really well with the beans or if you’re having spicy food too. I generally just try these with whatever spice I have to hand; below are my favourite if you want to mix it up from plain ol’ salt & vinegar….